US singer and actress Whitney Houston has died in Los Angeles, aged 48. We look back at the rise and tragic fall of a superstar. Police spokesman Mark Rosen told reporters Houston was pronounced dead at 15:55 pm (23:55 GMT) in her room on the fourth floor of the Beverly Hilton Hotel. “She has been positively identified by friends and family that were with her at the hotel, and next of kin have already been notified,” he added. The cause of her death remains unclear but Mr Rosen said there were “no obvious signs of criminal intent”. Houston’s background was steeped in soul and gospel music. Her mother was gospel singer Cissy Houston, she was cousin to singer Dionne Warwick and goddaughter to Aretha Franklin. The music industry, hours before this years Grammy Awards ceremony, can scarcely believe the news. Whitney Houston had been planning to attend a pre-Grammys party thrown by her mentor and close friend, Clive Davis. Guests have begun to arrive for the party, but it is unclear whether the event will go ahead. The scene at the Beverly hotel is frenzied. As well as police and the authorities, fans and the world’s media have begun to gather. The cause of Houston’s death is unclear, with the police saying investigations are ongoing. It may take days or even weeks for tests to return with conclusive answers. Having grown up in New Jersey, Houston began singing in church and then in the night clubs of New York, and was a model before being signed by Arista Records. At the height of her career in the 1980s and 90s she won many awards and enjoyed several number one singles and albums. Artists from Mariah Carey to Christina Aguilera have tried to emulate her bravura performances, but none of them were as good as the original, music critic Paul Gambaccini told the BBC. Houston also enjoyed success acting in blockbuster films such as The Bodyguard and Waiting to Exhale. In recent years drug use took its toll on the star and her voice – once acknowledged as one of the finest in pop music – was badly damaged. “She did have it all, but the record is there of the decline into drug use and the damage done from drug use,” said Gambaccini. Her marriage to Brown, with whom she had a daughter, Bobbi Kristina, ended in divorce in 2007. The marriage had been a tempestuous one, with allegations of domestic abuse. “The biggest devil is me. I’m either my best friend or my worst enemy,” Houston told ABC’s Diane Sawyer in a 2002 interview. Correspondents say Houston’s death will undoubtedly overshadow the music industry’s Grammy Awards, due to be held in Los Angeles on Sunday. She had been expected to attend the ceremony and her close friend and long-time mentor Clive Davis had recently hinted she might perform. “It’s her favourite night of the year … who knows by the end of the evening,” he had told AP. Civil rights activist Rev Al Sharpton said that on the morning of the Grammys, “the world should pause and pray for the memory of a gifted songbird”. For the golden girl of the music industry from the mid-80s to the late 90s, Whitney Houston’s decline, when it came, was spectacular. Her once serene image, matched by her majestic voice, was shattered by drug use in her later career and has come to be seen as a cautionary tale. Houston was born with unusually good musical genes. She was the daughter of gospel singer Cissy Houston, cousin of 1960s pop diva Dionne Warwick, and the goddaughter of Aretha Franklin. As a child, Whitney sang in the church, but by her teens was a backup singer for Chaka Khan, Jermaine Jackson and others, as well as being involved in modelling. By the late 1980s, she had become one of the world’s best-selling artists, notching up worldwide album sales of 200 million. Her eponymous 1985 album sold millions and spawned several hits including Grammy winner Saving All My Love for You, How Will I Know, You Give Good Love, and The Greatest Love of All. Her 1987 hit album Whitney included the hits Where Do Broken Hearts Go and I Wanna Dance With Somebody. Her effortless and powerful vocals also brought success in Hollywood. In 1992 she starred in The Bodyguard, which also gave her the memorable number one hit I Will Always Love You – a cover of a Dolly Parton song. It was the Grammy record of the year and remained at the top of the charts for weeks. Whitney returned to the big screen in 1995 and 1996 with Waiting to Exhale and The Preacher’s Wife – both spawning soundtrack albums, and another hit studio album. But she had started to abuse drugs – cocaine, marijuana and pills – and the hits stopped. Her behaviour became more and more erratic. Her tumultuous marriage to singer Bobby Brown, whose career was also overshadowed by drug abuse, became a public spectacle. Whitney’s once flawless voice became raspy and hoarse, and she was unable to hit the high notes for which she had become famous. She checked into rehab clinics twice before declaring herself drug-free in 2010 – but in the interim, she missed concert dates and was stopped at an airport due to drugs. She was so thin during a 2001 Michael Jackson tribute concert, that rumours spread she had died the next day. Houston tried to stage a comeback with the 2009 album I Look To You, but things fell apart when a concert to promote the album was clearly off-key. Broadcaster and music journalist Paul Gambaccini described Whitney’s Houston’s voice as “the template for female vocal performers for the last 30 years”. But in the end, he told the BBC, she became the victim of a “self-administered decline” and, sadly, threw all it all away. “It’s always a tragedy; it’s a life lost, a great talent squandered,” he said. With her incredible vocal range and purity, runway good looks and girl-next-door charm, Whitney Houston was an out-of-the-box superstar when she arrived on the music scene in 1985. Her meteoric rise included record-setting hits, groundbreaking videos and a promising film career. Whitney Houston, whose stellar voice made her a superstar but who was long plagued by personal problems including drug abuse, died Saturday. She was 48. But by the mid-1990s, rumors of marital woes and drug abuse began to tarnish her image and she took a downward spiral that saw her name emblazoned in sordid tabloid headlines rather than glowing reports of musical success. Word of the 48-year-old singer’s death broke early Saturday evening as the industry gathered in Los Angeles for the official Pre-Grammy Gala at the Beverly Hilton Hotel hosted by her mentor Clive Davis, chief creative officer of Sony Music Worldwide. Her publicist, Kristen Foster, confirmed that the singer died in her room at the Beverly Hilton, but the cause of her death is unknown. Houston had been expected to attend the gala. The party went ahead as planned, though Houston’s body was still in the building. Among the celebrities seen arriving for the gala: Britney Spears, Tom Hanks and Rita Wilson, Serena Williams, Jon Voight, Skrillex, David Foster, Diane Warren, Penny Marshall and Neil Young and his wife Pegi. In recent years, Houston had struggled to regain her past glory. In 2009, she released I Look to You, her first studio album in seven years and first since going through rehab and divorcing Bobby Brown, her husband of 14 years, in 2006. While the album did debut at No. 1 and sold more than 1 million copies, it failed to produce any massive hit singles, or receive hoped-for Grammy Awards nominations. Her subsequent overseas tour met with mixed reviews, with disappointed fans demanding refunds. 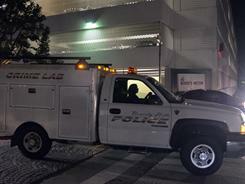 A Beverly Hills police crime lab truck leaves the Beverly Hilton Hotel where Whitney Houston was found dead. It was a sad end for the once incandescent star who paved the way to pop success for other African-American singers such as Janet Jackson, Anita Baker, Mariah Carey and Mary J. Blige, and has been cited by the likes of Beyoncé, Alicia Keys, Jennifer Hudson, Britney Spears, Christina Aguilera and Leona Lewis for inspiring them to become singers. The gospel-trained Houston was the daughter of singer Cissy Houston, goddaughter of Aretha Franklin and cousin of Dionne and Dee Dee Warwick. Houston was already an up-and-coming magazine model (she was one of the first women of color to grace the cover of Seventeen) when record mogul Clive Davis signed her to his Arista Records label in 1983. In an interview accompanying the 2010 reissue of her debut album, Whitney Houston: The Deluxe 25th Anniversary Edition, Davis recalls first seeing her backing up her mother at the New York City club Sweetwater’s. Together, they would make music history. Davis spent more than a year grooming Houston, lining up producers and collecting the right material. Her first hit, Hold Me, a duet with Teddy Pendergrass for his 1984 Love Language album, went to No. 5 on the R&B chart. It was a precursor to Whitney Houston, which arrived in 1985 to rave reviews. First single You Give Good Love was a top 5 pop hit, and its follow-up, Saving All My Love for You, was even bigger. It went to No. 1, as did How Will I Know, the video for which became one of the first by an African-American female to get heavy rotation on MTV. The Greatest Love of All also spent three weeks at the top of the charts, and Whitney Houston wound up selling 13 million copies domestically. She earned three nominations at the 1986 Grammy Awards, including one for album of the year. Saving All My Love for You won for female pop vocal, and her performance of the song on the show would win her an Emmy Award later that year. The Greatest Love of All would also be nominated for record of the year at the following year’s Grammys. Houston’s superstardom was solidified in 1987 with the release of Whitney, which sold 9 million copies in the USA and spawned four No. 1 singles —I Wanna Dance With Somebody (Who Loves Me),Didn’t We Almost Have It All, So Emotional and Where Do Broken Hearts Go— to give her a record seven chart-toppers in a row. A fifth single, Love Will Save the Day, was a top 10 hit. Thanks to her record sales and concert grosses for 1986 and 1987, Forbes ranked her as the eighth-highest-earning entertainer at the time. Her crossover success was unprecedented for an African-American woman, but she soon found herself defending it against critics, who claimed her hits lacked soul. Her third album, 1990’s I’m Your Baby Tonight, took her in a more urban direction thanks to production by L.A. Reid, Babyface, Stevie Wonder and Luther Vandross, but its reception was less spectacular. The album peaked at No. 3 while selling 4 million copies, though singles I’m Your Baby Tonight and All the Man That I Need topped both the pop and R&B charts. Still, big things and big changes were on the horizon for Houston, whose 1991 Super Bowl performance of The Star Spangled Banner remains the yardstick by which other singers are judged. Two things happened in 1992 that would profound alter her career: She made a move into acting and making soundtracks with The Bodyguard, and after a three-year courtship, she married R&B singer and former New Edition member Bobby Brown. In The Bodyguard, she starred as a singer being protected from a stalker fan by Kevin Costner’s title character. The film grossed more than $121 million at the box office, and the soundtrack had an even bigger payoff for Houston. Her cover of Dolly Parton’s I Will Always Love You, distinguished by Houston’s a cappella intro, stayed at No. 1 on the Billboard Hot 100 for a then-record 14 consecutive weeks and had significant stints atop the R&B and adult contemporary charts as well. The album also spawned top five hits I’m Every Woman (a Chaka Khan hit on which Houston had sung background when she was 15) and I Have Nothing. The album sold 17 million copies in the USA, won three Grammys, including album and record of the year, plus a slew of other awards. Two years later, Houston performed at a state dinner at the White House honoring newly elected South African President Nelson Mandela, and she would later be the first major artist to perform in that country, playing three shows to 200,000 people. Her next film, 1995’s Waiting to Exhale starring Angela Bassett, was also a hit with a huge soundtrack. This time, she teamed with Babyface to co-produce the star-studded album, and she contributed to its success with Exhale (Shoop Shoop), Why Does It Hurt So Bad and Count On Me, a duet with CeCe Winans. She earned $10 million for her next role, 1996’s The Preacher’s Wife, which starred Denzel Washington and Courtney B. Vance. While it didn’t do as well at the box office as the previous two films, Houston got her best review yet as an actress. The soundtrack saw Houston cutting loose in a gospel setting. It featured six songs with the Georgia Mass Choir, including He’s All Over Me with gospel legend Shirley Caesar. I Believe in You and Me and Step By Step were both radio hits. Houston branched off into TV in 1997, producing a remake of Rodgers & Hammerstein’s Cinderella starring Brandy with Houston as the Fairy Godmother. The highly rated ABC special earned seven Emmy nominations. That set the stage for Houston’s first studio album in eight years, My Love Is Your Love. The album sold 4 million copies in the USA, and spawned a successful world tour, but peaked at No. 13 on the Billboard album chart, making it her first album to fall short of the top three. Still, with production by Wyclef Jean, Missy Elliott and Rodney Jerkins, it had the hits When You Believe with Mariah Carey, Heartbreak Hotel, It’s Not Right But It’s Okay, My Love Is Your Love and I Learned From the Best. As the ’90s closed, Houston’s popularity was beginning to wane just as rumors about drug use with Brown swirled and reports began surfacing about erratic behavior and weight loss, along with missed interviews and canceled concerts. On Jan. 11, 2000, marijuana was discovered in Houston’s and Brown’s luggage as they passed through security at a Hawaii airport, though they boarded the plane and left before police arrived. Two months later, she was conspicuously missing when Clive Davis was inducted into the Rock and Roll Hall of Fame. She was also to have performed on the Academy Awards, but was fired by musical director Burt Bacharach. Just Whitney was her poorest-selling album to date, and none of its singles made the Hot 100’s top 40. She got positive reviews for 2003’s One Wish: The Holiday Album, but only modest sales. Houston’s image took further pummeling on the sordid 2005 Bravo reality series Being Bobby Brown, which gave an inside look into their family life. Critics savaged the show, but morbidly fascinated viewers tuned in to see just how low they could sink. The show was canceled after Houston decided to no longer participate. She separated from Brown in September 2006 and the divorce was finalized in 2007, with Houston given custody of the couple’s daughter, Bobbi Kristina. In a 2009 interview with Oprah Winfrey to promote I Look To You, Houston blamed an emotional abusive and jealous Brown for many of her problems, confessed that she laced her marijuana with rock cocaine and revealed that she’d spent time in rehab and had undergone an intervention by her mother. The album made its debut at No. 1 on the Billboard album chart with a career-best opening week of 305,000 copies sold. It was her first chart-topping album since 1992’s The Bodyguard. But the title track and the Alicia Keys-penned Million Dollar Bill had only modest success. Her post-release TV appearances were also spotty. Though the fans responded warmly, she had to apologize for her voice cracking at a three-song Good Morning America concert in New York’s Central Park. It came not long after the Oprah interview, which she says wore out her vocal cords. She gave a much better received performance of I Didn’t Know My Own Strength on the American Music Awards two months later. But the savage reviews of what would be her final tour in 2010 remain a stark reminder of the gorgeous voice she once had, and how much she lost to years of drug abuse and personal turmoil. It’s been over two years since Janet Jackson lost her brother Michael, but not a day goes by where the late King of Pop isn’t on her mind. Besides her undeniable talent, what is it about Whitney that Janet will always remember? Janet also offered up some words of wisdom to 18-year-old Bobbi Kristina. First season Bangladesh Premier League (BPL) T20 2012 cricket matches are scheduled for February 10 but the excitement has started already. Here’s a collection of official theme songs and promos released BPL teams to promote themselves. So, if you are a BPL Fan then you definitely need to Download BPL Theme Songs or the BPL Team Anthems for all the six franchises. Below are the BPL Teams Theme Songs Download Links. Remixes will be available soon. Watch & download Chinese New Year Songs 2012. Zhang Yufang a.k.a Grace Chang (葛兰) – Gong Xi Fa Cai (恭喜發財) [Literally: Congratulate You With Prosperity], which was apparently produced in 1956, songwriter: Min Yao (=Yao Min? ), lyrics: Li Jun Qing. Yao Li (姚莉) – Gong Xi Gong Xi (恭喜恭喜), with her brother Yao Man; this is perhaps the undisputed most popular Chinese New Year song of all time. Apparently recorded in 1946 in Shanghai with Chen Gexin composing the lyrics, it was not originally intended to be a CNY song, but rather a celebratory tune toasting the end of World War II. Wu Ying-yin a.k.a Wu Jianqiu (吳鶯音) – Ta Di Hui Chun (大地回春), which was apparently produced in 1946. The title literally means “welcoming of spring in the big land,” and ode to the “motherland.” She recorded the song when she was 24. She died in 2009. Melody composed by Hou Xiang. Apparently recorded in 1948, when the singer was 26. She died in 2007. Interestingly it’s interspersed with the opening melody of the Christmas song Jingle Bells! Lin Dai and Yan Jun (Chorus) [林黛与严俊 (合唱)] – 拜年 (Happy New Year), apparently produced 1956. The chorus apparently was written even earlier – before 1940. Songwriter: Yan Hua, lyrics: Jinquan. “White Light” a.k.a Shi Yongfen (白光) – Happy New Year to Wang Xiaoer (向王小二拜年), apparently produced in 1950, when she was 29. This song is even more tightly integrated with the Christmas song Jingle Bells than the other CNY classic, He Xin Nian. She died in 1999. Songwriter: [unknown]; lyrics: Chen Gexin. Sam Hui (許冠傑) – Cai Shen Dao (财神到), which was apparently produced in 1979. This is one of Sam Hui’s most enduringly popular songs. Hope you have enjoyed the Chinese New Year Songs 2012. The Rio Forge is designed for people that like to play hard and use music to play even harder. Rugged and compact, the Rio Forge Sport player uses no moving parts and stays solid even when your body is moving fast. Rio se510 is the value sports and fitness MP3 player for the active music lover on a budget.